APC Smart-UPS X SMX3000RMHV2UNC 3000VA + AP9631 Uninterruptible Power Supply UPS. In good condition and in full working order. Supplied with rails and bezel & AP9631 Network card. 1 x APC Smart-UPS X SMX3000RMHV2UNC 3000VA Uninterruptible Power Supply UPS INCLUDING BATTERIES. 1 x Set of rails. Save time with easy and convenient remote accessibility. Network manageable via serial, USB or optional ethernet. Includes Powerchute® Business Edition Software for convenient monitoring and control, safe operating system shutdown and innovative energy management capabilities. Low operating and maintenance costs with high efficiency, proven reliability and intelligent battery management. Patented green operating mode achieves efficiencies over 97%. Smart-ups was the first network UPS to be Energy Star certified. Intelligent battery management, pioneered by APC, maximizes battery performance and life through intelligent, precision temperature compensated charging. Dynamic battery replacement date indicator and automatic self tests insure battery reliability and warn in advance of needing replacement. Convenient, easy to connect, hot-swappable battery modules provide battery replacement without powering down. Peace of mind that comes with full equipment compatibility and reliability of a leader. Provides pure sine wave output which is recommended by server manufacturers using active power factor corrected (PFC) power supplies. Safety agency tested and approved means that you can deploy Smart-UPS with confidence that they meet or exceed the industrys most rigorous standards. Smarter productivity with ability to tailor to your specific application needs. Intuitive LCD interface provides clear information with the ability to configure the UPS locally with easy to use navigation keys. Over 15 different programmable settings including switched outlet group control allow for application specific settings, thresholds and notifications. Avoids costly power problems by keeping your IT equipment and data safe and available. Network grade power conditioning protects from damaging surges and disruptive noise. Solid state automatic voltage regulation boosts low input voltage up to 30% and trims high voltage up to 12% without battery operation. Reliable battery back-up capacity to power through outages or gracefully shutdown systems. Maximizes useful battery life by widening the input voltage window or tightening the output voltage regulation. Provides the ability to adapt the UPS for optimal performance in specific power environments or generator applications. Ensures the product has been tested and approved to work safely with the connected service provider equipment and within the specified environment. Automatic restart of loads after UPS shutdown. Automatically starts up the connected equipment upon the return of utility power. Periodic battery self-test ensures early detection of a battery that needs to be replaced. Warns when a battery is not available to provide backup power. Maximizes battery performance, life, and reliability through intelligent, precision charging. Boost and Trim Automatic Voltage Regulation (AVR). Gives higher application availability by correcting low and high voltage conditions without using the battery (not available on all models). Protects connected loads from surges, spikes, lightning, and other power disturbances. Prolongs battery life by regulating the charge voltage according to battery temperature. Provides management of the UPS via a USB port (not available on all models). Provides remote power management of the UPS over the network. Actively let you know if the unit is on battery, if the battery is low or if there is an overload condition. Quickly understand unit and power status with visual indicators. Provides management of the UPS via a serial port. Ensures clean, uninterrupted power to protected equipment while batteries are being replaced. Increases availability by allowing a trained user to perform upgrades and replacements of the batteries reducing Mean Time to Repair (MTTR). Provides early-warning fault analysis on batteries enabling timely preventive maintenance. Enables a quick recovery from overload events. Provides early-warning fault analysis ensuring proactive component replacement. 2.7 KWatts / 3.0 kVA. Output Frequency (sync to mains). (8) IEC 320 C13 (Battery Backup). (1) IEC 320 C19 (Battery Backup). 50/60 Hz +/- 3 Hz (auto sensing). British BS1363A, IEC-320 C20, Schuko CEE 7/EU1-16P. Input voltage range for main operations. Maintenance-free sealed Lead-Acid battery with suspended electrolyte : leakproof. LED status display with On Line : On Battery : Replace Battery and Overload indicators, Multi-function LCD status and control console. Alarm when on battery : distinctive low battery alarm : configurable delays. Full time multi-pole noise filtering : 0.3% IEEE surge let-through : zero clamping response time : meets UL 1449. 3.36inches (85mm , 8.5cm). 17.0inches (432mm , 43.2cm). 26.26inches (667mm , 66.7cm). 9.58inches (243mm , 24.3cm). 23.48inches (596mm , 59.6cm). 34.23inches (869mm , 86.9cm). # of Layers per Pallet. # of Units per Layer per Pallet. 32 - 104 °F (0 - 40 °C). Audible noise at 1 meter from surface of unit. VAT IS NOT PAYABLE BY PURCHASERS OUTSIDE THE European Union (EU) AND by purchasers in the EU (excluding UK)who are VAT registered. Please call freephone 0800 328 4995 or from outside the UK +44 7725 301 888. 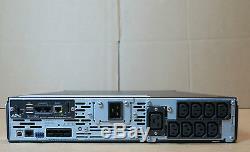 LM 158540 - ups needs rails added - 158541 (I/B: 158542) Bezel. The item "APC Smart-UPS X SMX3000RMHV2UNC 3000VA + AP9631 Uninterruptible Power Supply UPS" is in sale since Saturday, August 06, 2016.